The first protest, held on an unexpectedly balmy day in March, featured a karaoke machine, vodka-spiked lemonade and an inflatable hot tub on Cesar Chavez Street. The attitude was giddy, defiant. Then Sit/Lie was placed on the ballot as Proposition L. It passed in the November elections. And today it went into effect. The mood today is still defiant, but decidedly more damp. On Haight Street the Brass Liberation Orchestra squats over the wet sidewalk, while a protester carefully spreads out a recyclable shopping bag on the pavement before lying down and kicking his legs in the air like a downed cancan dancer. A light drizzle is falling out of the sky, and anorak-clad holiday shoppers bustle by. A few stop to take photos. Many seem to not even notice there is anyone on the sidewalk — as though the particular set of visual deflection skills developed by many San Francisco residents for avoiding eye contact with sidewalk-dwellers cannot be overridden even when confronted by a brass band in pink spandex. 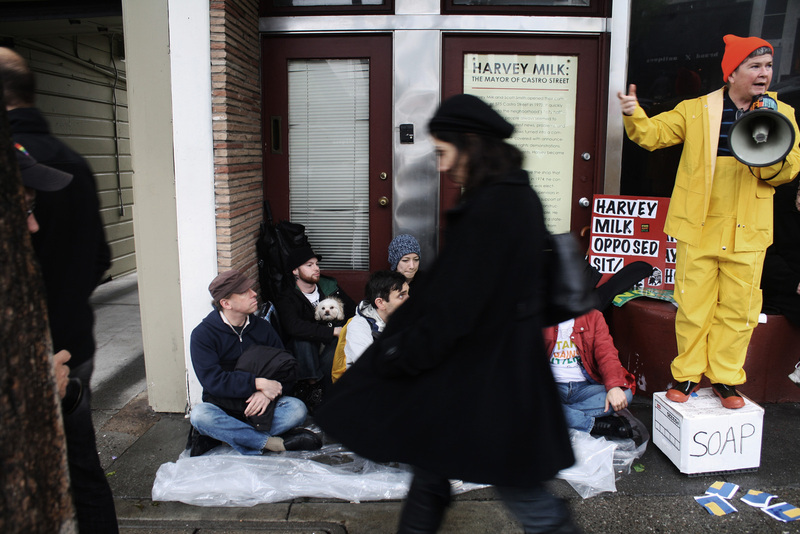 In the Castro, a group huddles together on a clear plastic painters’ tarp in front of the the former location of Castro Camera, Harvey Milk’s shopfront. They take turns standing on a cardboard box with “Soap” scrawled on it in black magic marker and yelling through a bullhorn. The queer advocacy organization HRC (Human Rights Campaign) recently leased the storefront with plans to sell Harvey Milk-related tchotckes there. Most of the statements issuing from the bullhorn are in opposition to this, rather than directly related to Sit/Lie. The HRC is just the sort of politically timid organization that Milk would have hated, the megaphone says. There is a connection, though. In 1970, a coalition that included Harvey Milk repealed San Francisco’s first Sit/Lie ordinance, passed two years earlier in response to the Summer of Love. At that time the police used it not only to target hippies, but gay men hanging around outside in the Castro. And so, as gays began to coalesce into a voting block, the law’s days proved numbered. In the Mission, every protest seems to be rained out. The closest thing to one is at 24th and Folsom, where a woman sits on a folding chair next to a “Sidewalks are for People” sign, talking on a cell phone. The Google map maintained by the protesters indicated there was going to be a tea party. She disappears into an open door behind her and emerges with another folding chair and a folding tea table. She unfolds the table and places a little jar of sugar with a tiny silver spoon in it, then disappears again and reemerges with two gilt-edged china cups and saucers, filled with steaming tea. She places them on the table and looks down on the scene admiringly. “I like my pretties,” she says. The tea is delicious. Powell’s protest is the only one that hasn’t been rained out because she has what none of the other protesters did — an awning. Does anyone make use of the awning besides Powell? Powell settles back in her chair and watches the 24th Street traffic go by — the crowd loitering and flirting in front of Philz, the smoke shop across the street lit by neon purple, even at 3 in the afternoon. The customers going in and out of the check-cashing place across the street. Sitting in a folding chair on 24th Street is somehow all the sweeter for being recently illegal. She looks up. A woman is walking toward us, a curious expression on her face. Nice writing and a fair report by Heather Smith. The rain may have dampened Saturday’s protests, but the opposition to people being criminalized for simply sitting or lying on the sidewalk is not going away!